So this is an interesting mini trend, illustrating and signing beauty products to make them that little bit more special. I first noticed this earlier this year when customers queued up to get Jo Malone to sign the bottles of her new brand Jo Loves, when she launched the perfume pop-up store in Selfridges. 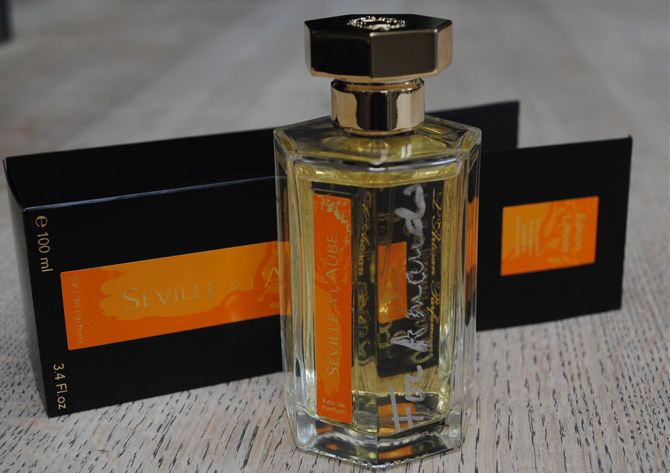 Last week I attended the launch of L’artisan Parfumeur’s lovely new, limited edition perfume Seville a L’Aube where the perfume’s maker Bertrand Duchaufour was signing bottles of the new fragrance in the store after an entertaining interview of him with co-creator/muse Denyse Beaulieu, by Katie Puckrik (more here on that). 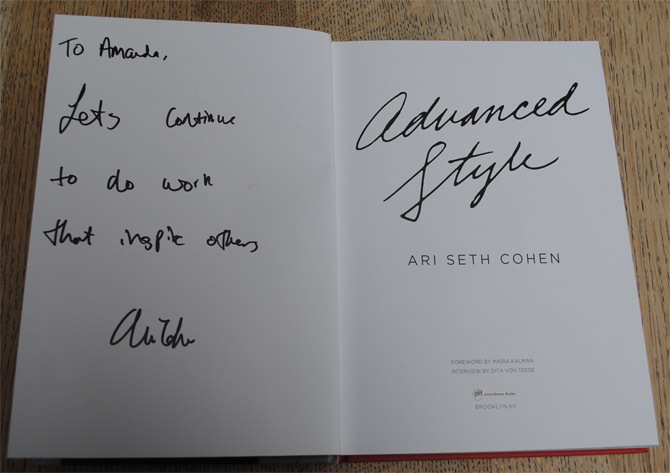 I guess it’s no different from getting an author to sign a copy of their book at a book launch, as Jane and I did at Ari Seth Cohen’s Advanced Style party, we know that people will queue for hours to get that personalised messages. I can’t think why this isn’t done more often and why we don’t get designers- who are definitely celebs in their own right- to sign the back neck labels of clothes, as it feels very special to have your name written on the product. 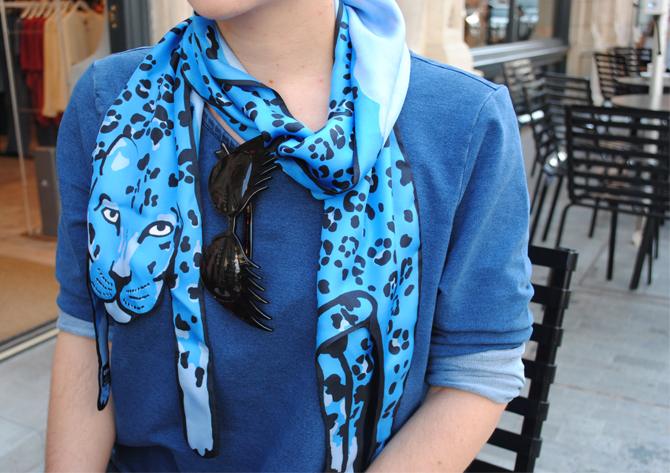 I have a cute message on mine, “For Amanda, with all my gratitude for your enthusiasm, warm regards Bertrand’ which sounds very personal and now of course I’m torn – shall I keep it forever without using it or not? I worry that just picking it up might wear away some of the letters. 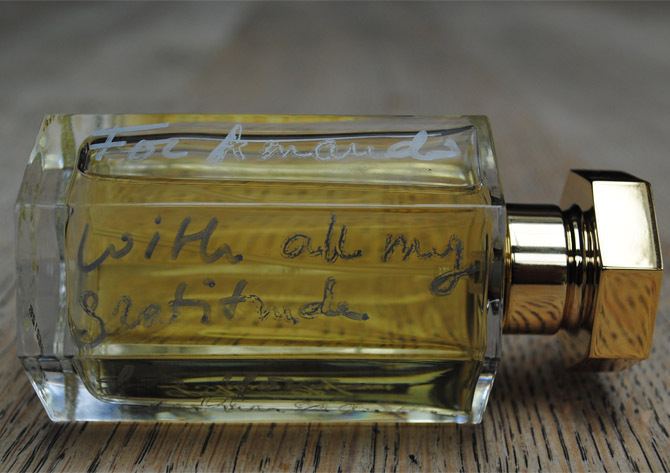 As perfumers come more into the spot light (as they have been doing of late) perhaps we’ll see more of this and there are other products I’d happily have signed, the inside of my Ally Capellino and Mimi leather bags, my Margaret Howell raincoat…. 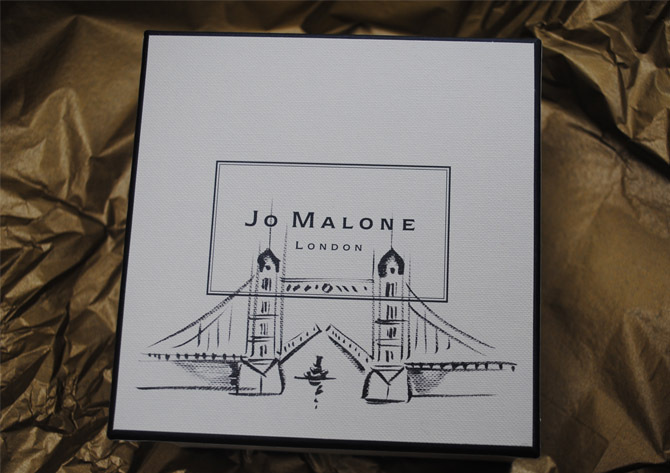 Continuing the trend in a similar way over at Jo Malone London, for the next week or two you can have the box your beauty purchase comes in adorned with a hand illustrated picture of one of London’s landmarks, to celebrate the Olympics being here. There are artists on hand in the London boutiques to customise your boxes -and we all LOVE a Jo Malone box, I can’t believe anyone throws them away- with your landmark of choice, in black pen for no extra charge, neat eh? It’s a great for making presents just a little more personal. If this appeals check with customer service to see if and when your local JM is host to an artist. When Jane and I launch our fantasy collection, we will be adopting this neat idea and will have artists on hand to add beautiful illustrations to the packaging and we will happily sign any of the clothes for you, I think it’s the least we can do to say thanks for buying!